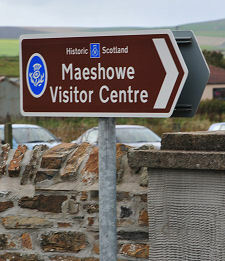 Intending visitors should note that access to Maeshowe is by guided tour only, with tours departing from the Maeshowe Visitor Centre at Stenness. Tour groups are transported to the site by bus and advance booking is strongly recommended. Full details of access arrangements can be found via the links in the "Visitor Information" section of this page. 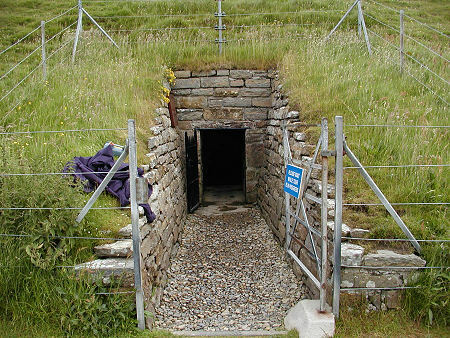 Maeshowe is the finest chambered tomb in North West Europe and is older than the Egyptian pyramids. But what makes Maeshowe so special is the way this magnificent 5,000 year old monument has been overlaid by another story written, literally, 4,000 years later. 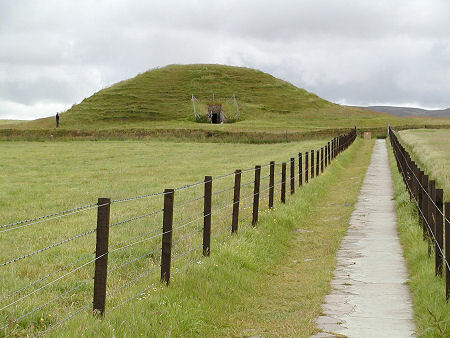 Maeshowe was probably built some time around 2800BC. 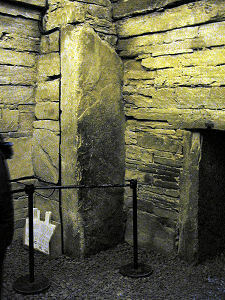 It postdates Skara Brae by a few hundred years, and it has been speculated that it was the greater organisation needed to produce something as large as Maeshowe that led to the gradual decline of settlements like Skara Brae. As the tomb was constructed it was buried in an artificial mound, itself containing structures and retaining walls to ensure stability. 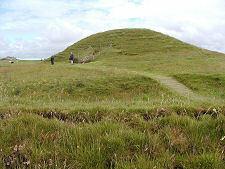 Much of the material for the mound probably came from the ditch that surrounds Maeshowe, which is 2m deep and 14m wide. 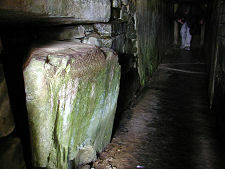 Maeshowe is entered through a low 9m long passage, with a large swivelling blocking stone still in place in its outer end. 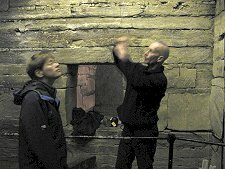 The passage climbs gently uphill (for drainage) and enters the main chamber, which is roughly square in shape and about 4.5m on each side. The sides are made up of gently corbelled flat blocks, fitted superbly closely together, with huge buttresses at each corner. 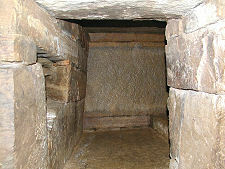 On three sides of the tomb there are side chambers. 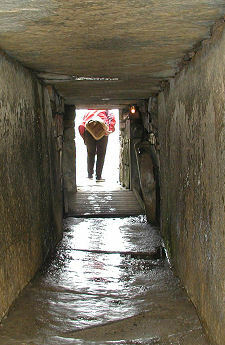 Each of these is roofed by a single huge slab, which is also keyed into and forms part of the wall of the main chamber. The workmanship is amazing. Overtopping everything is a white-painted stone cap that is probably lower than the original roof. This was placed here after the tomb had been excavated in 1861. 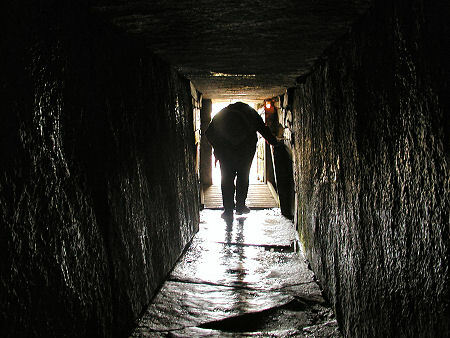 Although a great deal is known about the structure of Maeshowe, very little is really known about its purpose. It was presumably used to house the bones of the dead of the surrounding community, but only a trace of bone was found during the 1861 excavation. The only thing that does seem certain is that the alignment of the tomb was used as a calendar. 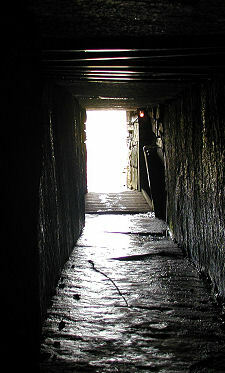 At sunset on midwinter's day the sun shines down the length of the entrance passage and illuminates an area low on the rear wall of the main chamber. It's been convincingly suggested that if you are living this far north, knowing exactly when the days are going to start getting longer again is a very important piece of information. It's easy to speculate that there were some wild midwinter parties held here 5,000 years ago. Towards 2,000BC Maeshowe seems to have simply fallen into disuse. There is evidence that Orcadian society was going through a difficult period at the time. This was probably due to a deterioration of the climate and consequential southerly migration of most of the population. So for the next 3,000 years Maeshowe was no more than a grassy mound in the Orkney landscape. According to the Orkneyinga Saga, Earl Rognvald of Orkney led a crusade to the Holy Land in 1150. On 6 January 1153, Harald Maddadarson landed in Orkney from Argyll in an effort to take the islands in the absence of the Earl. 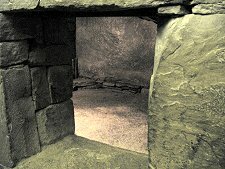 He and his men broke into Maeshowe through the roof and spent some time sheltering there. Later in 1153 Earl Rognvald and his followers returned from their crusade, and they in turn explored the newly-opened tomb. 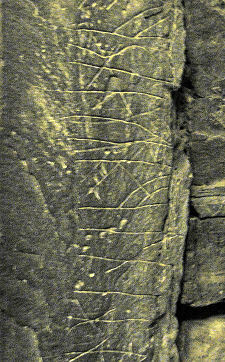 The evidence for this comes directly from the walls of the tomb, which carry many examples of graffiti left by the Vikings in the form of carved runes. These show just how little people have changed in the last thousand years. Many of the inscriptions are direct predecessors to today's graffiti. So you can find "Ottarfila carved these runes"; "Haermund Hardaxe carved these runes"; "Tholfr Klossienn's son carved these runes high up" (high on the wall near the roof); or the less modest "These runes were carved by the man most skilled in runes in the western ocean with this axe owned by Gauk Trandilsson in the South land". 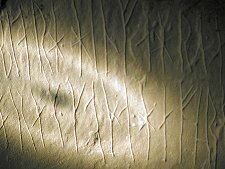 Other inscriptions could be easily found today spray-painted in city underpasses the world over: "Thorni bedded, Helgi carved" on the wall of one of the side chambers: Thorni was a woman's name. Elsewhere, in the main chamber, is the relatively innocent "Ingigerth is the most beautiful of women". Relatively innocent, that is, until accompanied by a drawing of a panting dog. Other pictures on display include a beautifully drawn and carved lion. A third type of Viking inscription in the main chamber has proved more intriguing. One reads: "It is surely true what I say that treasure was carried off in three nights before those... crusaders broke into this howe". The theme continues in another inscription that says: "To the north-west is a great hidden treasure. It was long ago that a treasure was hidden here." Most modern interpretations read these as fishermen's tales: would you believe an account starting "It is surely true what I say..."? 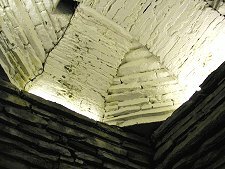 The activities of the Vikings weakened the roof of Maeshowe and some time later it collapsed, filling the chamber with stone and rubble. It was reported that Cromwell's troops tried to dig into the mound in the 1650s, but its rediscovery fell to a certain Mr Farrar in 1861. He tried and failed to make his way in by the entrance passage, then followed the Vikings in via the roof. His workmen cleared out the chamber and the landowner, David Balfour of Shapinsay, installed the protective roof that still exists today. No one has ever established when the many skeletons the tomb was assumed to have housed in the Neolithic period were removed. STB 4 Star Historic Attraction.